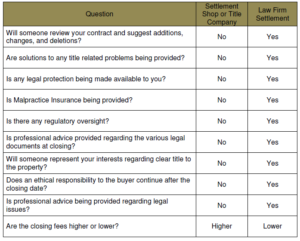 Why Use an Attorney for Your Real Estate Closing? When you purchase real property, you as the buyer have the option of choosing to have the closing performed by a licensed attorney. If you choose not to use the services of an attorney your real estate transaction will be closed by the lender, a Settlement Shop or a Title Company. The obvious question is what is the difference in terms of cost as well as the closing process itself? Let’s first examine the issue of cost. The cost to the buyer to utilize the services of an attorney is generally less than or the same. Copyright 2017 The Law Group. All Rights Reserved.